Nope, you're getting Grindor! Heh..oh well, I'll be doing it anyway cause I need sweet sweet shards. I like Grindor, definitely grew on me after hating him at first. Ultra Magnus would be nice though, glad to hear he's on his way. 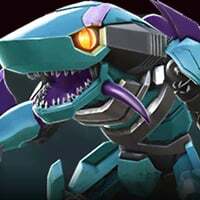 As a curiosity, any plans on doing an Android-exclusive bot at some point? Nothing planned at the moment, but that doesn't mean it won't happen in the future! Also, Grindor makes a great Base Defender. He's pretty Tanky and can take a beating! He's not necessarily new since people DO already own him. Plus we need more Tact bots. If it cant be found in crystals yet then it is "new"
Yeah Ultra Mag will still probably be the next new bot. That was the question posed in the other thread, not who would be the next arena. I think that Ultra Mags will be next fue to the lack of Tactician-class bots. If Kabam only cares about iOS, next bot should be Starscream. If they want to keep both plataforms balanced content-wise, they'll release Ultra Magnus. IMO, he's the ultimate tank character on the game.